Just a quick card I made for my mom the other day. Please excuse the absolutely pathetic picture, it was taken in a hurry before leaving for work. I've been waaay to busy to post it before now, and my hands are itching to make something! The retro stack is calling my name... All work and no play makes Eva a grumpy gal. 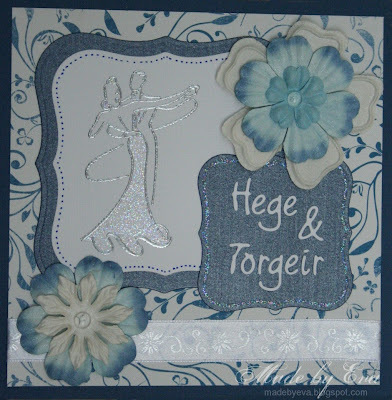 I got to use my new stamp on this one, and filled the dress with Stickles. Love the clean elegant lines of the stamp - and that there is not only a bride there, but a groom as well! There are lots of similar stamps, but nearly all of them pictures brides and dresses... Poor grooms, they are too often neglected in wedding stuff.